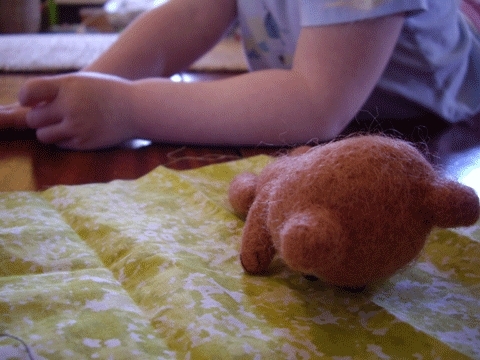 Here is a funny little scene…I caught Clara giving her bear some tummy time. I thought it was pretty cute. That is a bear that I was going to sell, but Clara made off with him before he was finished. His new name is "baby bear." This is why it is difficult to ever get any animals made; they are confiscated! Too sweet! They are little mimics, aren’t they? btw, I think I’d have eaten that entire banana cake if it was anywhere near me. yum!! Way to cute!! Kids sure are a blessing! !